​​Would you like to join a circle of yoga friends? Click the image to get your copy now! Click here to visit the Yoga Circles website! Click here to get a free excerpt of the book! If you're a yogi, and you would like to connect with a community of like-minded seekers, I think you'll be interested in my Yoga Circles project! 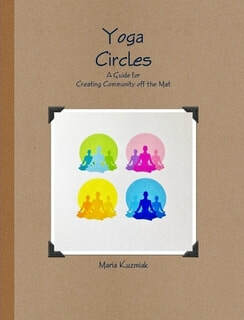 In 2017, after a few years of writing, editing, and gathering stories of transformation from other yogis, I completed the book, Yoga Circles to use as a guide for creating community off the mat. The goal of Yoga Circles (both the book and the project) is to help you deepen your experience of what it means to be a yogi through study, conversation, support, and fun! Yoga Circles are in-person and online groups of yogis who drawn to the spirituality and beauty of classical yoga. We also live in the modern world! Most of us started by taking a hatha yoga class because we wanted to reduce stress or get in shape. We quickly learned that yoga is so much more! I hope you'll join or create a Yoga Circle wherever you are. Visit the Yoga Circles website to learn more about the project, and contact me if you have any questions, suggestions, or inspiration to share! Let's support each other on the amazing journey that is yoga!